We’re currently in a motel room in Bemidji, about eight miles behind schedule. The first days have been harder than expected and have given us little time for playing music, lounging on our hammocks or blogging. We’ll have a longer post on these first few days as soon as we can catch our breath. And dry our clothes. Long story. A long story already! I’m sure you will make up the time farther down the river. Here at PDF we are all mentally paddling with you. Thanks! Hi to all at PDF. Don’t worry too much about being behind. The water is pretty high right now on the Minnesota portion so going a little slower to let things go down won’t be a bad thing. 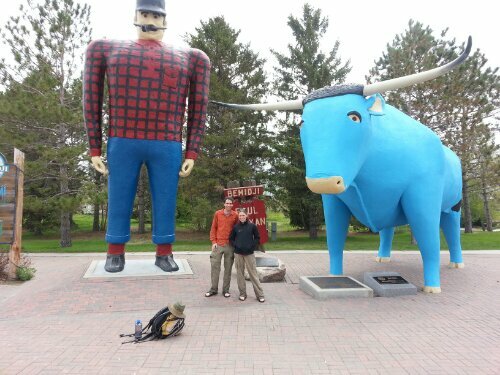 We were pleased to meet you in Bemidji. We, on our trek back to Oregon (in a covered station wagon). I admire and envy the two of you. Its an adventure you have embarked upon, one you will never forget. Grace and I will be following your journey. Pleased to meet you as well! We’re now about 200 miles past Bemiji so things are going pretty well here.